How many gumballs are in there? How much would it cost to buy them? How many gumballs are inside? How many quarters does that gumball machine take? How many gum-balls are in the machine? How many bubblegum balls is that? How many gum balls are there? How many coins do you need to empty that machine? What's the ratio of one gumball to the gumball machine? How can we write a general equation so that we have a good chance of winning those "how many are there in the jar" games? How many lollies are there? How long would that flavor last if you chewed every gumball? how many gumballs are inside the machine? How many gumballs are in there? How long will it take that little kid to eat all of them? How much money would it cost to buy all the gumballs? How many gumballs are there? How many gum balls are in this machine? How long would it take to chew all this gum? How many? When will it make its money back? how many kids would it take to empty that beast?! 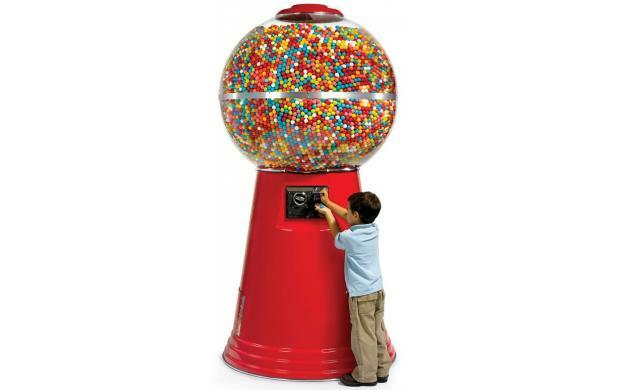 If each gum ball costs a nickel, how much would it cost to purchase all of the gum balls from the machine, assuming the container is full. How many gumballs are in that machine? How many gum balls are in the machine? What would happen to the kid if all the gumballs started falling out? Would he be hurt? Killed? What is the probability that I get a blue one? How many more gumballs would it take to fill the machine to the top? How much money can be made by selling all the gumballs? how many children would fit in the sphere? How much money would it cost to get all the candy? If somebody offered you $10 ooo for this gumball machine, would you take it? If your mouth was so huge that it could chew all of that gum, how large of a bubble could you make? How many gumballs in there? How old would this 4 year old be if he took one gumball each day? How many gumballs? More interesting: how long would it take to empty if the hatch broke? Who has enough time and money to create a gumball machine this large? How many gumballs? How much value? How large of a bubble could you blow if you chewed them all up? How much would it cost to get all of the gumballs? Probability of getting a *insert color here*? How tall is the dispenser? What is the probability of getting a green gum-ball?